The best recipes on the net! Cook bacon in a large Dutch oven over medium until crisp, about 6 minutes, turning once. Transfer bacon to a plate lined with paper towels, reserving drippings in Dutch oven. Crumble bacon, and set aside. Add olive oil to drippings in Dutch oven; increase heat to medium-high. Add yellow onion, carrots, and celery; cook, stirring occasionally, until tender, about 3 to 4 minutes. Stir in garlic, kosher salt, and pepper, and cook until fragrant, about 1 minute. Add chicken and broth to Dutch oven. Cook on medium-high until broth begins to boil, about 2 to 3 minutes. Reduce heat to medium-low. 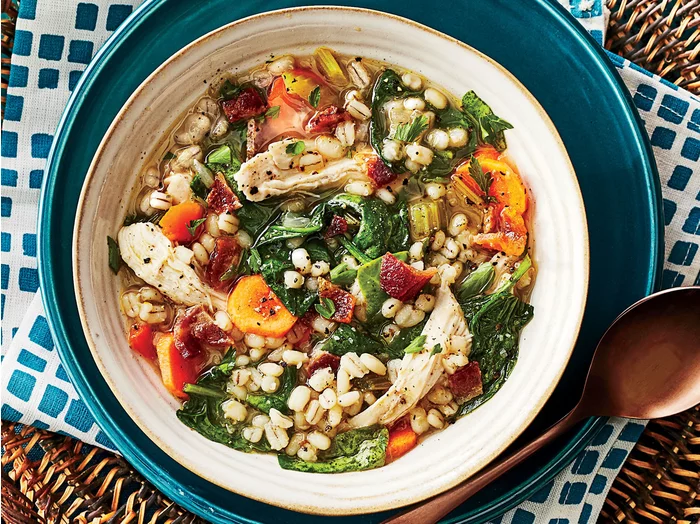 Stir in barley, and cook until chicken is cooked through and a thermometer inserted in the thickest portion reads 165°F, about 8 to 10 minutes more. Remove chicken, shred into large pieces, and return to Dutch oven. Add spinach, and stir until wilted, about 1 minute. Stir in parsley; top each serving with crumbled bacon.